Tikves lake is located 12km south-west of Kavadarci on the River Crna or 3km from the village Vozarci. The Tikves lake was developed in 1968 (the oldest artificial lake in Macedonia) by directing the waters of the Crna river and building a 104m high dam. The dam is built of stones and it is 338m long. 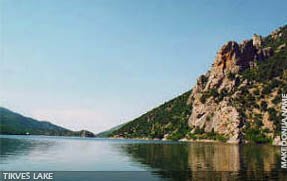 Tikves lake is the largest artificial lake in Republic of Macedonia. The Tikves lake covers an area of 14km2 and 29km with a capacity of 475 million m3 water. The water of the Tikves lake is used for irrigation and deriving electricity. The irrigation is performed by the hydro-system Tikves and in the vicinity of the dam the hydroelectric plant "Tikves" is located. The Tikves lake is rich with fish. Most dominant is the sheat-fish that can reach the size of 2m. 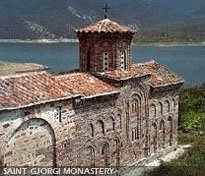 On the shore of the lake is the Monastery Polog and the church St. Gjorgi, a significant monument of culture from 14th century richly decorated with frescoes. It is assumed that it dates back to 9th century because the architectural style is very similar to the architectural style of the churches of Ohrid. A big quantity of water from the lake is released during the summer just to prevent an environmental disaster of the fauna in this river because of the low water level. Thanks to the irrigation Tikves Lake made Tikves a real oasis with endless vineyards and orchards. Today Tikves Lake with its micro-climate establishes itself as an recreational and tourist resort.